You could argue that, until the iPad came along, everybody liked the idea of a tablet device but didn't know what they'd actually do with one. It's not enough to simply get the hardware built: you've got to have intuitive software, an effortless user experience and the right timing. And even then there are no guarantees. 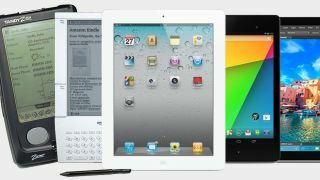 The arrival of the iPad kicked off a new tablet era, one that's now evolved to Pro models and 2-in-1s. Here's our comprehensive look back in time at the history of the tablet. You could say that the idea for a tablet computer was born back in the 1960s. When Alan Kay and his colleagues at the Xerox Palo Alto Research Centre dreamt up the Dynabook, they envisaged a portable tablet-style device that would primarily serve to give children easy access to any digital media. It was the perfect name for a new and dynamic device that would act as a paper and pencil, artist's easel, typewriter and musical instrument all in one. In short: an OLPC device way before its time. Sadly, however, the Dynabook never got past the concept stage due to the technological limitations of the day. While the geeks of the 80s dreamt of a futuristic Dynabook or electronic Star Trek data pad, what they actually got was the chunky GRiDPad. Built by the GRiD Systems Corporation, this tablet PC ran MS-DOS, supported stylus input on a 10-inch monochrome screen and lasted for 3 hours between charges. Impressed? Analyst Andrew Seybold was: "The GRiDPad is a creative breakthrough in laptop computer design," he wrote in 1989. "It may well capture the title of 'the computer for the rest of us'." Unfortunately, the GRiDPad cost a wallet-emptying $2,370 and was followed by similarly overpriced and underpowered rivals, including 1992's Compaq Concerto. Of course the PDA is an important part of the tablet story. While the GRiDPad never arrived, GRiD engineer Jeff Hawkins hit on the idea of taking the tablet and shrinking it down. He founded Palm Computing to pursue the project and produced the Zoomer touchscreen device with the help of Tandy and Casio. It was still a struggle to get anybody to buy it. As Infoworld's Kevin Strehlo wrote back in 1993: "I still can't recommend depending on a pen-based computing device to anyone but a UPS delivery person or someone who fills out forms for a living." The world still wasn't ready for a mass market tablet device. As we've already said, timing is everything when it comes to tablets. John Sculley, the CEO of Apple in the early nineties, coined the phrase Personal Digital Assistant (PDA) to describe the Newton MessagePad, and the device itself appeared less than a year later with a whopping 640k of RAM. That was matched with a 20MHz ARM 610 processor and a 336 x 240 pixel display. Most people agree that Apple's Newton platform was ahead of its time, and it would be three years before Palm would respond with the Palm Pilot 1000. For now, PDAs were much more interesting than tablets. Microsoft tried to get us all interested in tablets again at the turn of the millennium, and two years later in 2002 Bill Gates said: "The tablet is a PC that is virtually without limits – and within five years I predict it will be the most popular form of PC sold in America." Not quite Bill, but well done for trying. If you look at the success of the iPad, Microsoft got three aspects of its tablet strategy disastrously wrong: it tried to make tablets full computers, it tried to sell them as primary PCs, and it focused on business users first. You get points for the vision, Microsoft, but the real world execution was lacking at this stage. For a brief moment in 2003 we thought that the tablet had arrived in the shape of the 10.4-inch Compaq TC1000. It looked the part, weighed the part and (for web browsing) acted the part too - but matching Windows XP with a Transmeta Crusoe processor wasn't the wisest of choices. The performance was lousy. In the years that followed, manufacturers searched for a form factor that would excite more than the usual early adopters and tech journalists: see the Ultra Mobile PC (UMPC), then the Mobile Internet Device (MID), then the netbook. What we really wanted was an iPad, but we just didn't know it yet. While gadget fans waited for somebody to launch a usable tablet that wasn't trying to be a PC, Amazon went off on a technology tangent with the Kindle. While the first model was underwhelming, it proved beyond doubt that the time was right for ebooks and ereaders to make their move to the mainstream. Apple launched the iPad in April 2010 with a 9.7-inch display, 10-hour battery life, powerful 1GHz A4 processor and access to the biggest app library on the planet. Like most Apple products, it wasn't just early adopters and gadget-obsessed fanboys who slapped down their money and shouted: "I want one!" The surf-from-the-sofa, pinch/zoom, Angry Birds allure of the sweetly-designed iPad also brushed over its technical shortcomings (including no camera). The masses were finally ready to welcome tablets into their lives, although there were those who didn't see the point of a tablet device (and still don't). The second iPad was faster, thinner and lighter, and had cameras - it confirmed that yes, tablets were really a thing now, and everyone was going to have to get used to it. At this stage 90 percent of the tablets shifted in the world were iPads and it looked as though Apple had another iPhone-sized hit on its hands. The iPad 2 was also the first device to come with iOS 4.3 installed on it, and it's important to remember the role that software has played in the evolution of the tablet as a computing device - iOS is largely responsible for tablets taking off, bring a simple, intuitive interface to a large slab of glass. iOS was certainly way, way ahead of Android on tablet-sized devices at this stage, but Samsung just went ahead and put out a few slates anyway - 2010's Galaxy 7.0 was the first Android tablet to be released but it was only the year after that Samsung really started to get serious with its tablet devices. The tablet-specific Android 3.2 Honeycomb (remember that?) was on board the device and this slate set the basic foundations for the really rather good Samsung Tabs that are on sale today. Back in 2011, though, Samsung and Android were still a long way behind what Apple was doing with the iPad. The first real Android tablet success story: the Nexus 7, made by Google and Asus. Okay, Android was still clunky on screens above 5 inches, the design aesthetics didn't come close to the iPad, and it certainly didn't run as smoothly, but the Nexus 7 was fun, friendly and - most importantly - very cheap. It was a tablet to toss on the sofa or to let the kids loose on, and it beat Apple to the 7-inch punch - that size of tablet that fits in one hand comfortable and often makes more sense than something approaching 10 inches diagonally. It was of course followed by another successful model the year after. In 2012 we realised that actually what we all wanted was a 7.9-inch tablet not a 9.7-inch one - the smaller size seemed to fit a lot of tasks better, made the device more portable, and of course reduced the price too. It made the original iPad size look laughably large by comparison for a lot of casual users. The iPad mini had us all asking that perennial question again: what exactly are tablets for? What can they do that a big phone can't? The iPad mini 2 added a Retina display, but since then the smaller iPad has been rather neglected by Apple (perhaps because the iPhone has become bigger), which is a shame. The history of the Surface is closely linked to Windows 8 and then Windows 10 - Microsoft's mission to build an operating system that would switch smoothly from desktop to tablet and back again. Just like the software running on them, the Surfaces have got better over time, and the latest models are very good devices indeed. The Surface line (and indeed Windows) is now hitting its stride, even though the first device was something of a disaster. Even if Microsoft didn't get it right first time, its vision of super-thin, 2-in-1 tablets with keyboard covers was a solid one, and one which virtually every hardware manufacturer has copied since. Google seems to have abandoned the idea of making cheap Android tablets now, but Amazon has picked up the slack with some gusto. It's released a dizzying number of Fire tablets since its first slate back in 2011, with last year's 7-inch model costing a mere £50 (or $50 in the US). That's a very, very cheap tablet. How do you reinvigorate a tablet market you helped properly establish five years previously? If you're Apple, you make a tablet that's bigger and more expensive than ever - the 12.9-inch iPad Pro is a gigantic, super-powered tablet with a starting price of £679/$799, which is enough to bag yourself a decent laptop. With a gorgeous screen and a creative stylus, the iPad Pro redefined the tablet once again. Not only that, it followed the template Microsoft had set (and Google has since copied) for 2-in-1 tablets with thin keyboards and capable OSes. Where the tablet goes next, well... it's going to be interesting to find out.